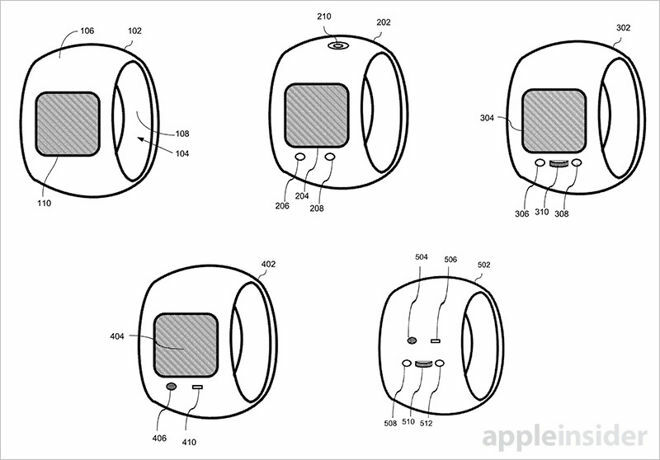 It seems rumors that claimed Apple conducted research into an "iRing" wearable product were based in reality, as a new patent application reveals work on a finger-mounted device stuffed with microphones, motion sensors, a haptic feedback system, biometric sensors, cameras and even a small display. The fairly comprehensive patent application, titled "Devices and methods for a ring computing device" and published by the U.S. Patent and Trademark Office on Thursday, describes an advanced ring-style wearable that uses voice, motion and touch input to control and interact with larger computing devices. In many ways, the claims read like an overview of Apple Watch, but distilled into a much smaller form factor. While there are disparities between Apple's ring computer and production hardware —front- and user-facing cameras among the most audacious —the document outlines a number of capabilities currently being marketed as tentpole Apple Watch features like heart rate monitoring and inductive charging. The application falls short of name dropping Watch, but notes the ring device might be used as a stand-in for a "smart watch" crown mechanism. Interestingly, a good number of technological advances described in today's published paper were introduced with Watch, including Force Touch and the Taptic Engine, suggesting Apple was mulling an alternate design for its first foray into wearables. Topeka Capital Markets Brian White told investors about a very similar concept after taking a tour of Apple's East Asian supply chain in 2013, saying a ring device would serve as a remote control for a full-blown Apple television set. Both products failed to materialize. As for the filing, Apple details what is basically a miniature computer crammed into a shell that wraps around a user's finger. Powered by an onboard processor, the device sports multiple input and output components, such as touch pads or touch screens measuring one to five centimeters on the diagonal. Using a mix of multitouch, voice and gesture input, wearers would use the ring to control a variety of products, like an Apple TV's onscreen UI or an iPhone. 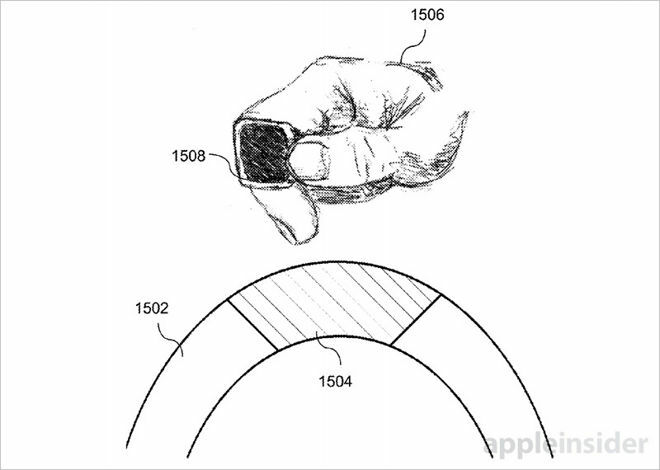 When worn on an index finger, one could conceivably operate the ring's touch sensitive surface with a thumb, but to make things easier the document also describes a mechanism akin to Apple Watch's Digital Crown. Alternatively, built-in accelerometer and gyroscope modules are provisioned to accept gesture input with enough precision to facilitate handwriting capture. A user might even wear two rings to control multiple aspects of a host UI. Also incorporated is a tactile feedback interface capable of responding to user input via audio cues and controlled vibratory pulses. Apple incorporates identical haptic feedback technology in its Taptic Engine, variations of which have seen implementation in Apple Watch, MacBooks and iPhone 6s. Closely tied to the Taptic Engine is pressure-sensitive input —Force Touch on Watch and 3D Touch on iPhone —which the ring also supports to some degree. 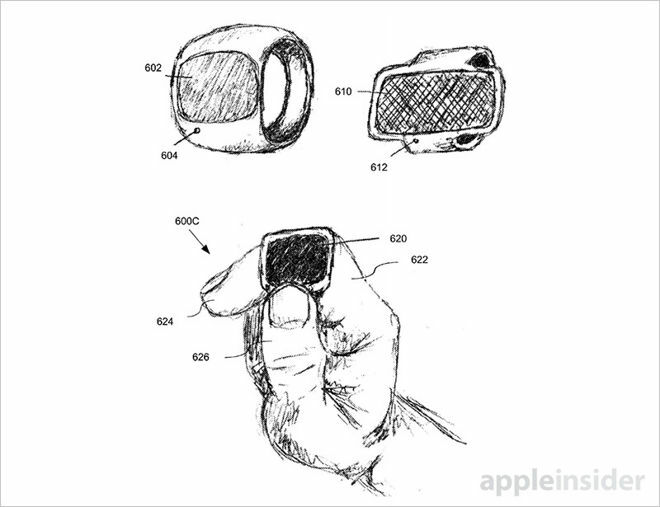 Aside from physical interaction, Apple's proposed design sports microphones for voice commands, much like Apple's new Siri Remote for Apple TV. While not specifically mentioned, the ring could save power by offloading voice processing to a remote device, a tactic adopted by Watch. In fact, Apple's application suggests using a keyword to trigger voice dictation, suspiciously similar to Watch's "Hey Siri" feature and an always-on iPhone 6s version powered by Apple's M9 motion coprocessor. Apple's ring talks to a paired device via any acceptable means of wireless communication including Wi-Fi, cellular, Bluetooth and NFC, the latter of which can be used in interesting ways. For example, the document describes a method by which one user authorizes a money transfer to another ring user simply by shaking hands. In this particular case voice commands are used to authorize the transaction, with a user saying, "By shaking hands with Steve I agree to give him $20." The technique can also be used to pass along messages and other protected digital data. Apple mentions any number of different materials can be used to construct a viable chassis, from precious metals like gold or platinum to stretchable material like silicone. In some cases the body is segmented to allow for correct sizing. One embodiment allows for an electrically controlled actuator to automatically latch down on a user's finger, adjusting circumference based on data from embedded sensors. A multitude of alternative embodiments and use case scenarios are outlined in Apple's original filing, including accommodations for automatic control of smart home devices, manual control of in-car entertainment systems, GPS location data acquisition, phone call support and more. It is unknown if Apple intends to bring such a device to market, but given the current trajectory of Apple Watch a commercial debut seems unlikely. As miniaturization techniques advance and consumers warm to the idea of wearing their tech, the company might one day launch a product similar to the one described in today's patent. Perhaps more important than future product prospects is the information that can be gleaned from today's filing regarding Apple's aspirations for Watch. Person-to-person Apple Pay, deep HomeKit and CarPlay integration, video game control; all are possibilities for Watch in the near term. Extrapolating for hardware suggests GPS, standalone cellular and a plethora of sensors could be in the cards. 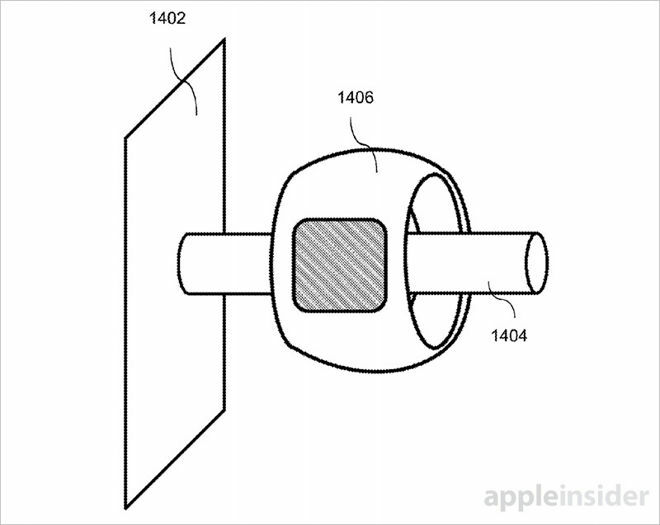 Apple's ring computing platform patent application was first filed for in April 2015 and credits Marcos Regis Vescovi and Marcel van Os as its inventors. It relates to a separate unpublished application filing from 2014.